The old adage is true: the more you explore Africa, the more there is to discover. And as the collection of places to visit grows, you do your best to keep up with the pace of this mounting and seemingly impossible list. But happily, some fabled, adventurous, borderline-mythical destinations float their way to the top of the wish list. Gorongosa National Park in Mozambique. The Danakil Depression in Ethiopia. Zakouma National Park in Chad. Places where it seems only the gritty elite of Africa’s pioneer safari-goers have braved. Adam Bannister and I, with a group of adventurously like-minded friends, had an opportunity to visit one of these heralded destinations, deep in the jungled heart of the continent. A place with almost as fantastic a name as what it has to offer. A place called Odzala. Odzala-Kokoua National Park, roughly the size of the US state of Connecticut, is a wild and verdant matrix of savannah and primary rainforest in the Republic of Congo’s northwest, bordering Gabon and not too far south of Cameroon. And while I was obviously excited to acquaint myself with some of the roughly 450 species of birds in the park, what it is most well-known for is its remarkable diversity of mammals. The biggest drawcard is undoubtedly the western lowland gorillas that call this corner of Africa home. Although they are far and away the most numerous of the four recognized gorilla species, they are still critically endangered and fewer tourists have encountered this species than the famous mountain gorillas of Uganda, Rwanda, and DRC. In fact, Ngaga Camp, one of three rustic-chic bush camps operated by the Congo Conservation Company within the park, is quite possibly the best place in the world to observe these great apes in the wild. Our group of eight split into two groups and enjoyed treks with our guides, Liam and Alon, through the thick marantaceae (tall, broad-leafed plants in which the gorillas spend most of their time) in search of one of two habituated families. These treks can turn into proper bushwhacks, bobbing and weaving through stereotypical central African jungle, all the while doing battle with clouds of harmless (but maddening) sweat bees. Of course, this is what makes it so rewarding when you do finally catch up with and set eyes upon these great black beasts. Having only ever seen mountain gorillas before, I was struck by their smaller cousin’s agility, often climbing high up in trees like chimpanzees (which we also often heard in the distance) in search of fruits and other foods, communicating frequently with soft vocalizations and occasional chest beats. Their constant activity made photography difficult, but sometimes it’s important to put the camera down and simply observe. Ngaga Camp, tucked into dense jungle, also offered fantastic birding, barefoot forest treks, and night walks, and we found ourselves desperately not wanting to leave when the time finally came. Our wistfulness for Ngaga, however, was quickly eclipsed by Lango Camp and its beautiful views over a pristine bai. Lango served as the perfect base for exploring Odzala’s maze of waterways on foot, sometimes up to our waist. These expeditions were among some of the most exhilarating I’ve ever undertaken, literally and utterly immersed in such an emphatically wild environment. It was exceptional. Best of all, after a long and enjoyably toilsome day, we reveled in spending our evenings on Lango’s deck, watching the sunset with cocktails in hand as hundreds of African green pigeons flocked tightly overhead and docile forest buffalo wallowed about below. On a particularly memorable evening, while enjoying the coolness of the stream ourselves, a handsome forest elephant bull magically and soundlessly materialized from the surrounding rainforest at dusk, just a couple hundred meters upstream. Positively magnificent are these forest-dwelling relatives of the savanna representatives we know so well. We spent our last night at Mboko Camp, from where we explored the Lekoli River by boat and had extraordinary encounters with forest elephant mining for minerals in the middle of the river. Birds, butterflies, and several species of monkey gamboled through the trees. It was a relatively leisurely way to conclude a wonderfully exhausting week-long expedition through just a fragment of this remarkable jewel of a national park, and we wholeheartedly embraced it. That river, like the whole of Odzala, was magical; it was representative of the wild sense of discovery the park offered as a whole. We agreed we could float down that river all day long, anxiously anticipating whatever awaited us around the next bend. And such is the allure of these truly off the beaten track safaris experienced by a hardy few: a childlike sense of wonder mixed with a fearless explorer’s insatiable yearning for discovery. 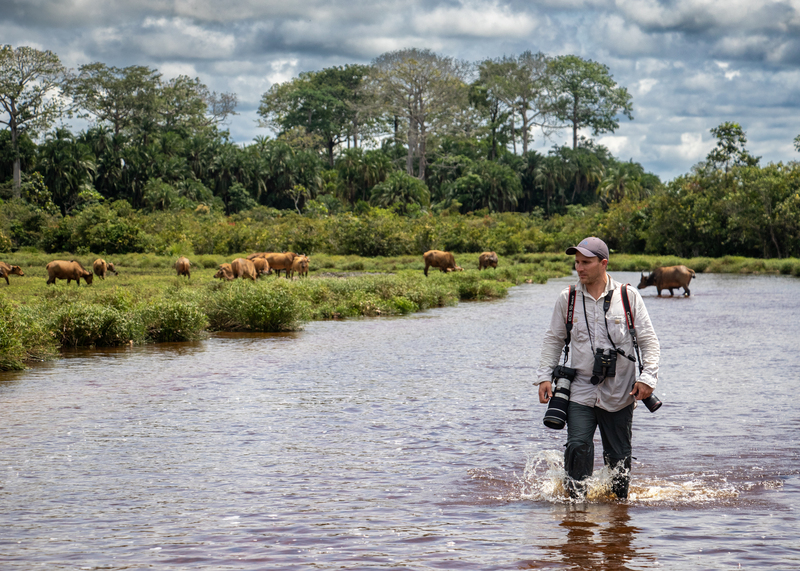 Thank goodness for places like Odzala, and the small but passionately dedicated organizations like the Congo Conservation Company and African Parks who work so hard to protect them, offering us the opportunity to explore and discover the truly wild.